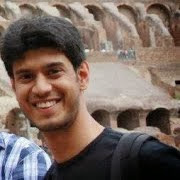 Evangelist, tinkerer, dog-lover and Technical Marketing Engineer, Cisco. This tutorial is meant to be a quick-start guide to get you up and running with an IOS-XRv Vagrant box. take a look at the rest of the “XR toolbox” series. Note to Users: We try our best to offer the community a development platform for IOS-XR that brings the latest features in XR to your laptop or development environment. Having said that, any issues found on IOS-XRv64 are fixed on a best-effort basis and we do not guarantee an SLA on fixes. We strive to provide a platform that the community can work with and help stabilize through their use. Any feedback is appreciated and you can always leave your comments below. Tha above items are applicable to all operating systems - Mac OSX, Linux or Windows. If you’re using Windows, we would urge you to download a utility like Git Bash so that all the commands provided below work as advertised. The last stable version of XR vagrant was 6.1.2.These images have been out for a while, and should work well. Pick this if you want something that works for sure. Of course, you should replace your-cco-id with your actual Cisco.com ID and API-KEY with the key you generated and copied using the above link. The curl command will take around 10-15 mins as it downloads the box for you. If it happens pretty quickly then it probably means you still don’t have access and you can check the downloaded box file to see if it is a vagrant box (about 1.8G) or a simple “unauthorized” html document. 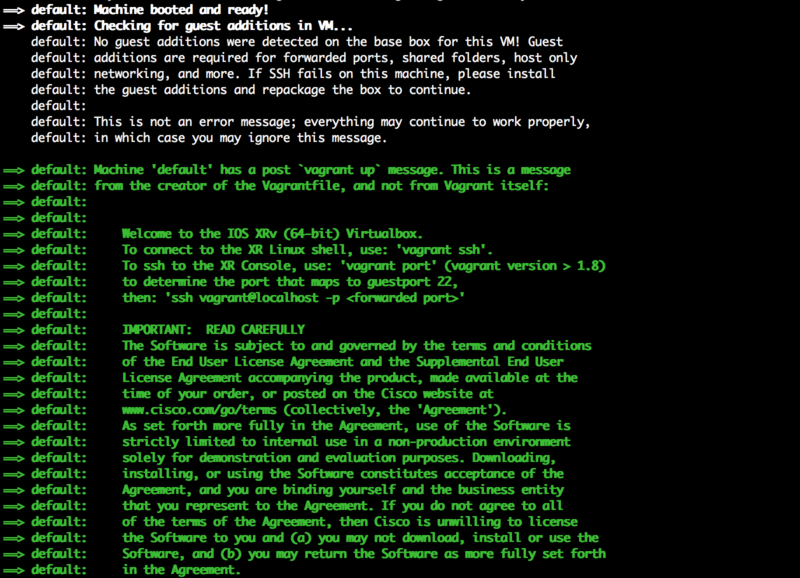 Now, in this directory, let’s initialize a Vagrantfile with the name of the box we added. This bootup process will take some time, (close to 5 minutes). You might see some ` Warning: Remote connection disconnect. Retrying…` messages. Ignore them. These messages appear because the box takes longer than a normal linux machine to boot. The reason we select the XR linux shell as the default environment and not XR CLI, should be obvious to seasoned users of Vagrant. In the future,Vagrantfiles that integrate chef/puppet/Ansible/Shell as Vagrant provisioners would benefit from linux as the default environment. XR SSH runs on port 22 of the guest IOS-XR instance. provider supports automatic port collision detection and resolution. The authenticity of host '[localhost]:2223 ([127.0.0.1]:2223)' can't be established. RSA key fingerprint is 65:d1:b8:f6:68:9c:04:a2:d5:db:17:d8:de:04:cb:22. Warning: Permanently added '[localhost]:2223' (RSA) to the list of known hosts. Bear in mind the RAM and CPU resource requirements per IOS-XR vagrant instance before you proceed with this section. A 3 node topology as shown below will require 8-9G RAM and can be shared on a 4-core CPU with your laptop’s OS. If you compare this with the topology above it becomes pretty clear how the interfaces of the XR instances are mapped to individual links. The order of the “private_networks” is important. 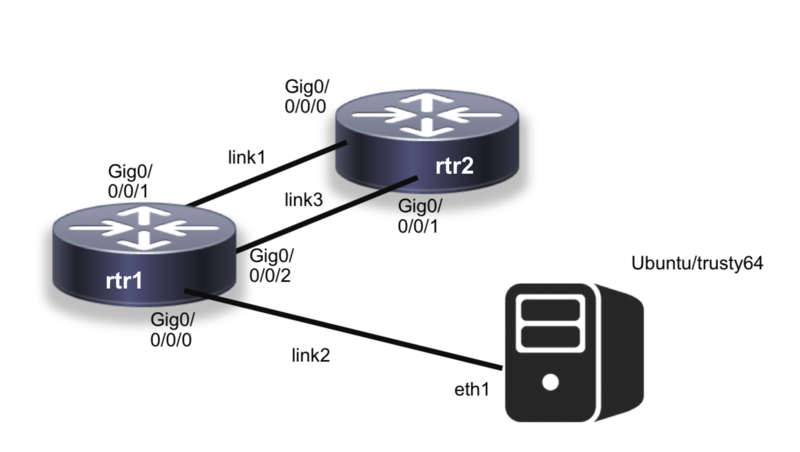 For each XR node, the first “private_network” corresponds to gig0/0/0/0, the second “private_network” to gig0/0/0/1 and so on. As before, we’ll issue a vagrant up to bring up the topology. This will take some time, possibly over 10 minutes. The only point to remember is that in a multinode setup, we “name” each node in the topology. The authenticity of host '[localhost]:2201 ([127.0.0.1]:2201)' can't be established. Warning: Permanently added '[localhost]:2201' (RSA) to the list of known hosts. 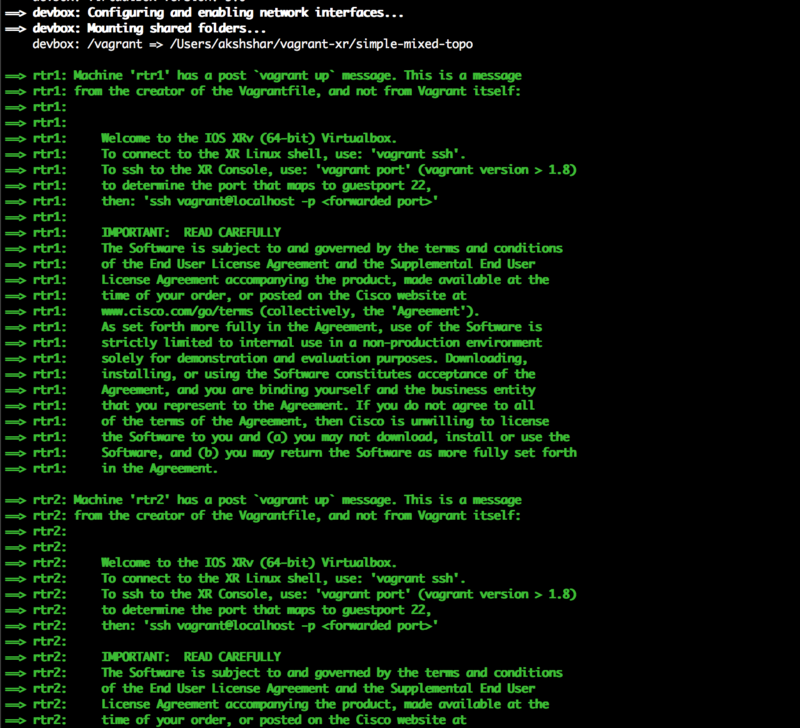 That’s it for the quick-start guide on XR vagrant. Launch your very own XR instance using vagrant and let us know your feedback in the comments below! Head over to Part 2 of the XR Toolbox series where we look at bootstrapping a Vagrant XR instance with a user-defined configuration on boot —> Bootstrap XR configuration with Vagrant.